June is Pride Month and I just love a good reason to try out some artistic recipes. In the past, Lavender has featured Pride recipes by Ross Sveback and I hope you go back to find them here and here. There are recipes for Skittles flavored vodka, the original rainbow layer cake, rainbow mini donuts, rainbow bread, unicorn poop cookies, and all sorts of other things. This year, I wanted to find something that was both brilliant in color and brilliant in execution. A no-fail, no-talent recipe. You see, I’m not trained to do this. I just hope to not lose a finger when I’m cooking and filming at the same time. So, I hope you find this as easy to execute and serve as I did. It’s a delight to see how people react to Pride Pasta. It’s hard not to smile. I chose fettuccine noodles for this recipe, rather than other forms of pasta. You’ll see at the end that they remind me of ribbons and show a bit more color than a spaghetti or linguine version, being wider and having more surface area. 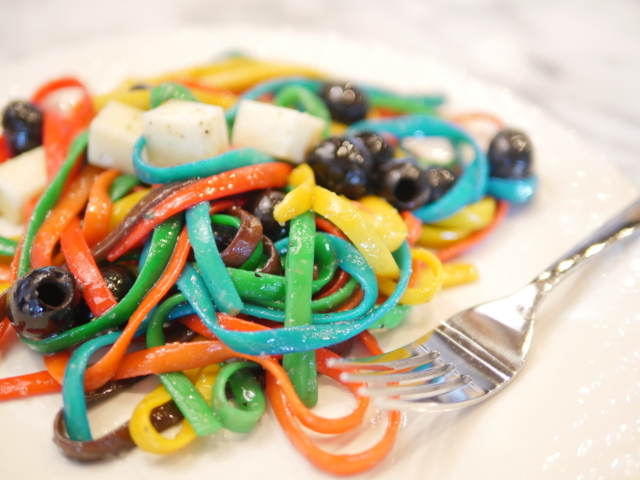 I also tried different sauces for the rainbow-colored pasta, and the trick is to use a clear sauce or dressing, because anything white or opaque, like alfredo sauce, ended up taking on some of the color that eventually migrates from the noodles. Also, choosing a chunky mozzarella cheese with black olives was deliberate, to help show a sharp contrast and make the noodles “pop” more; other cheeses would have dulled the appearance of the whole presentation and too many add-ins could also detract and change the color composition. I would, though, recommend slicing the olives because leaving them whole as I did here was mostly a pain in the neck when it came time to actually eat the dish with a fork…they looked good whole, but rolled around and avoided the fork in that form. When testing the storage and transport of this dish, I’d recommend eating it within four hours of tossing it together. If you’re taking it to a potluck, cook and color the noodles at home but try to compose the salad on site. But, if you need to transport it composed, it should be fine and not mix too many of the colors when the noodles move and get jostled. I threw one set of noodles with dressing, olives, and cheese into a resealable bag and took it to my cabin with me. All of that movement didn’t change the presentation too much that first day, but on the second day a few of the colors were transferring between the different noodles and the white of the mozzarella chunks were graffiti-ed with stripes of color that made them look like confetti. So, while the recipe will last for days in the refrigerator and still taste good and look colorful, I’d recommend consuming it the same day you throw it all together. Carb-load for all of those Pride activities and have a wonderful time celebrating this community. Bring a pot of water to a full boil. Add salt and fettuccine to water and stir, fettuccine tries to stick together. Do not add olive oil to the water if you normally might, because the oil will affect the coloring process later on. Allow the noodles to cook anywhere from 7 minutes (as recommended on the package) to 16 minutes (which is my preference). Drain and run cold water on the noodles to cool and rinse away some of the starch. Split the pasta into 6 sections and put a section of pasta into each bag, being sure to seal it securely. Then, mix the coloring and noodles together for a minute before setting each bag aside for 5 minutes or so. Section by section, give each bag one last mix before dumping the pasta into a strainer in the sink. Run water on the pasta to rinse the color away, feel free to really agitate it with your hands…the fettuccine is pretty sturdy. Remove pasta from the strainer and onto a paper towel. Blot with another paper towel to try to remove as much liquid as possible. If there’s still a lot of color bleeding off of it, put it back into the strainer to rinse longer. Repeat with each color of pasta, being sure to rinse the strainer completely between colors. For assembly, feel free to leave the noodles in their colored sections or mix them up as I did in the video. Either way, they’re playful and brilliant. Add things to the pasta, but in the case of all these colors, remember that less is more. Enjoy. And Happy Pride, friends. Recipe: Pride Pasta – Lavender Magazine from Lavender Magazine on Vimeo. Special thanks to Tablespoon for the recipe and tutorial that taught me how to make this great dish.